Some Experience Needed: ability to center clay at wheel. 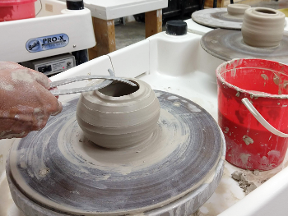 This wheel throwing class is designed for intermediate and advanced students to improve skills used at the pottery wheel. We will complete more complex and challenging projects working to create multi-piece forms. Each class will begin with a demonstration followed by hands on instruction. Items will be glaze fired. In this six week course we will learn about: lidded jars, knob handles, nesting bowls, two part stacked vases, and glazing. Class 1: Clay wedging for lidded jar. Demo: throwing jar and lid. We will focus on measuring skills to make a lid that fits well. Thrown pieces will be saved for trimming. Class 2: Clay wedging for handles. Demo: trimming lids and pulling knob handles or alternative handles and spouts. Class 3: Clay wedging for consecutively sized bowls. Demo: Throwing three consecutively sized bowls. Thrown shapes will be saved for trimming/handles. Class 4: Demo: Throwing in multiple parts to make a large vase. Work on prior projects or practice some forms we have discussed. Consider decoration with texture and attachments. Class 5: Demo: glazing. Students will glaze their bisque ware. Class 6: We will discuss our glaze fired pottery! Free day to finish up any unfinished projects.